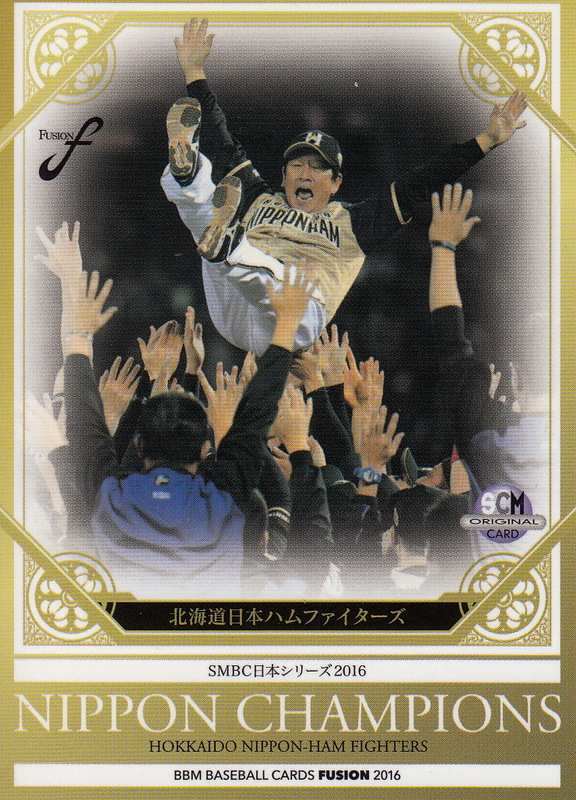 Fusion bonus cards - five additional "Ceremonial First Pitch" cards for Ami Inamura plus a "Leader" subset card celebrating the Fighters Nippon Series Championship. 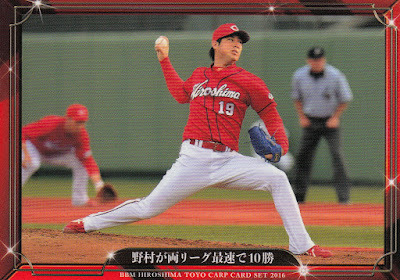 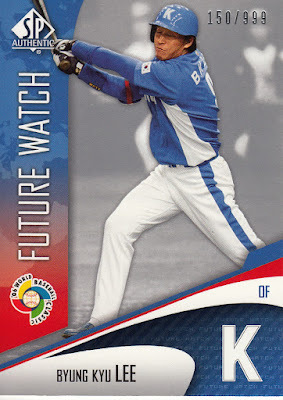 - When I did my preview of the "Time Travel 1975" set, I predicted that four of the six cards in the "Born In 1975" subset would be Hiroki Kuroda, Koji Uehara, Kazuo Matsui and Kazuya Fukuura. Taking a look at the set checklist, I see that I was correct. The other two players are Yoshinobu Takahashi and Kenshin Kawakami which is a bit of a cheat since neither of them are still active. 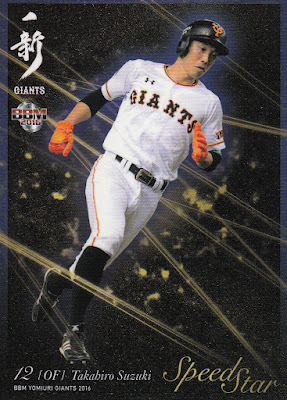 - The Fusion set is "fusing" the 1st Verison update and "Ceremonial First Pitch" subsets from 2nd Version, the leader subsets from the pre-2014 sets, and the "Historic Collection" sets (including the "Legendary Player" inserts from the 2016 "The Ballpark Stories" set). 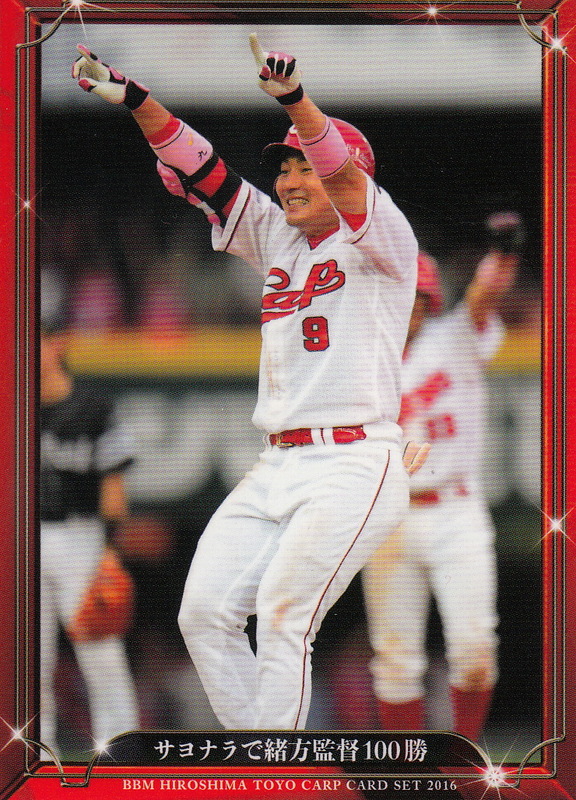 - I don't know if it's mentioned in the interview with her, but besides the seven BBM "Ceremonial First Pitch" cards she has this year (one in 2nd Version, one in Fusion and the five in this issue), she also had a card in Epoch's Japan Women's Baseball League set that came out in October. - I think that the Masterpiece spread in the color section is for cards that were available as redemption cards which is why they weren't included in the ads for the set in SCM 119. 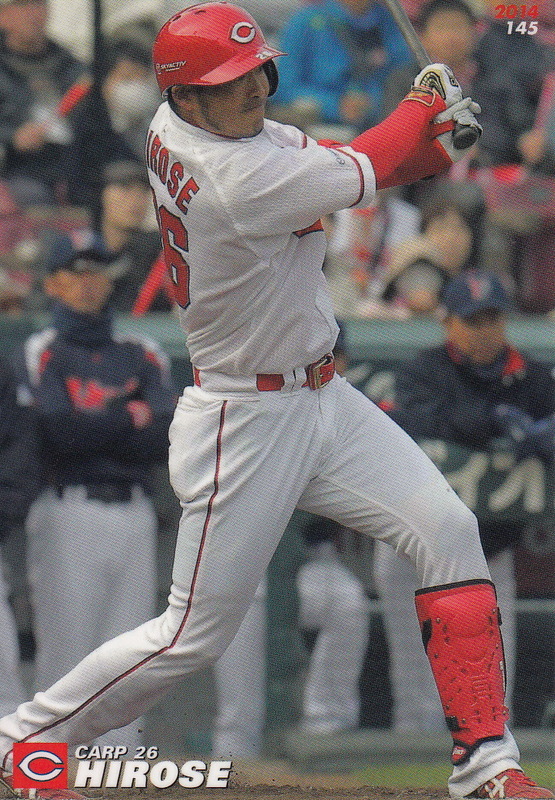 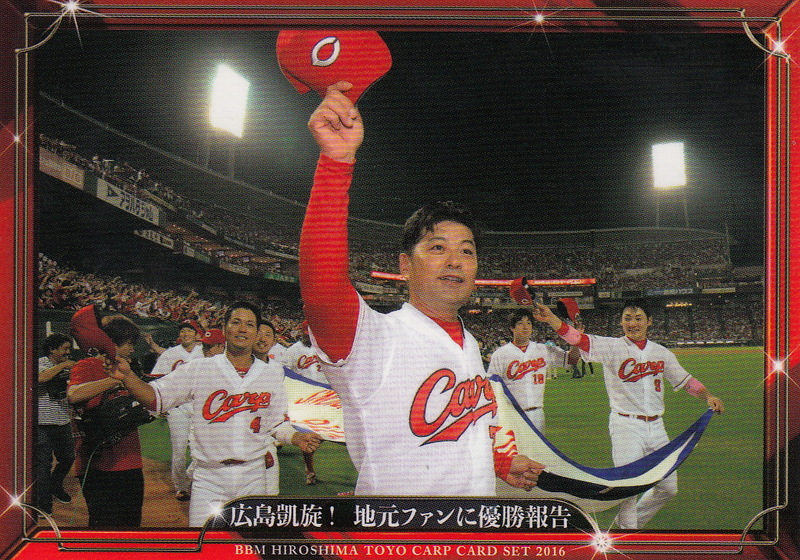 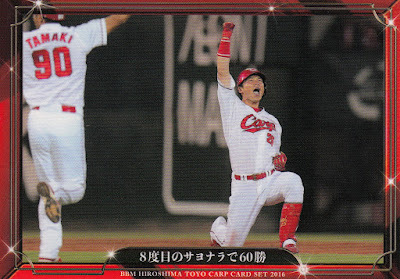 Jun Hirose of the Carp is yet another player calling it a career. 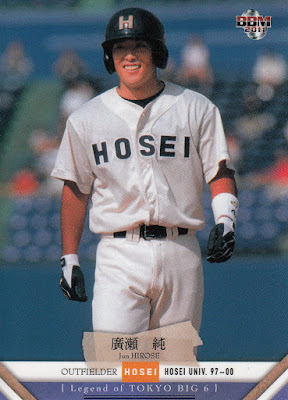 Hirose attended Hosei University of the Tokyo Big Six collegiate league where he won the Triple Crown as a junior in (I think) the spring season of 2000. 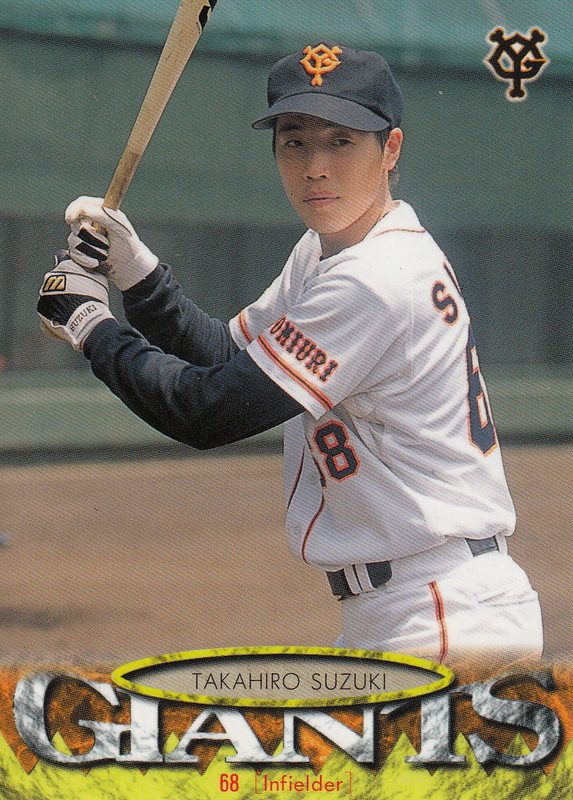 He also was a member of the Japan National team for the 2000 Sydney Olympics (and unfortunately did not have a card in either of the sets for that team). The Carp drafted him in the second round of the fall 2000 draft. He debuted with the ichi-gun team early in the 2001 season but he mostly was a backup player for the first nine years of his career. 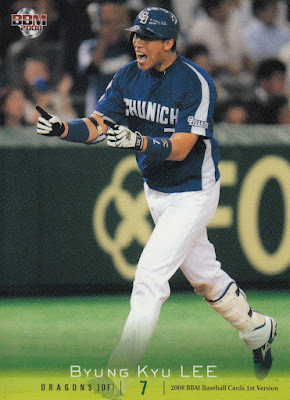 He became a full time player for the first time in 2010 and hit .309 with 12 home runs. 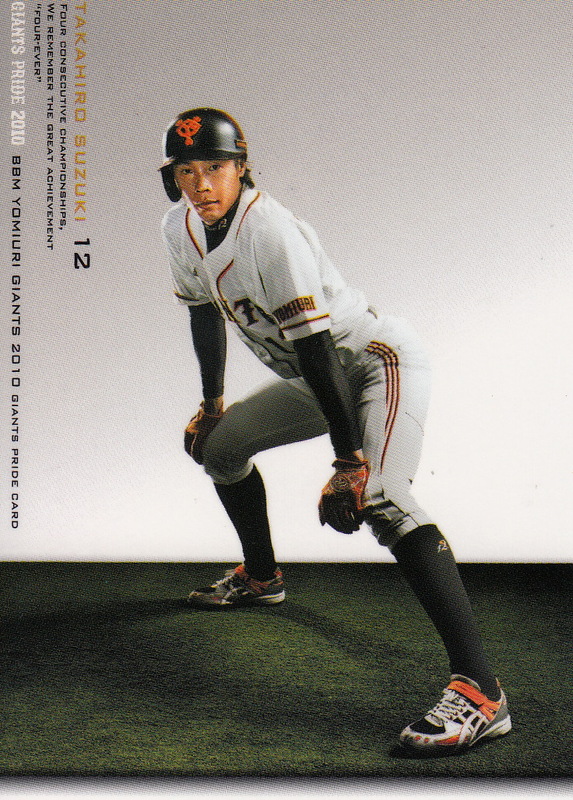 He made the All Star team and won a Golden Glove award that year. He went back to a part time role the following season and remained that way pretty much the rest of his career. 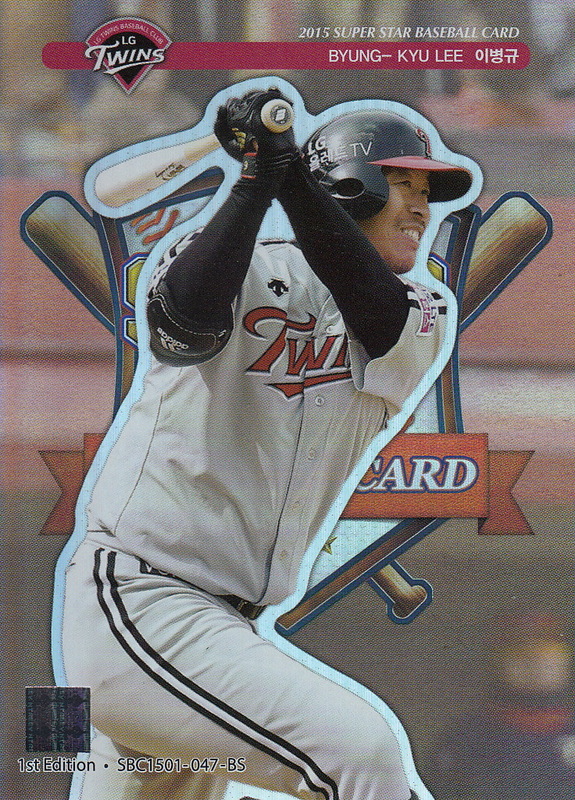 He set a record for getting on base safely in 15 consecutive plate appearances in April of 2013 and made the All Star team for a second time that year. 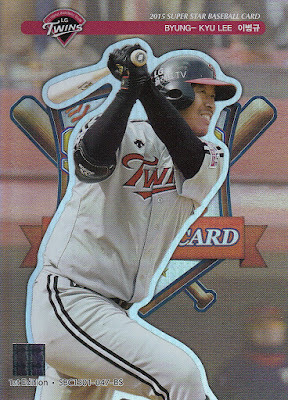 He played almost entirely with the farm team the past two seasons - his only appearance with the top team was his retirement game at the end of September this year. His BBM rookie card was #364 in the 2001 set but he didn't have another card in a BBM flagship set until 2007. 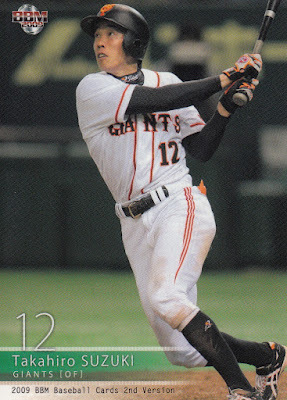 His first Calbee card wasn't until 2010 (#135). 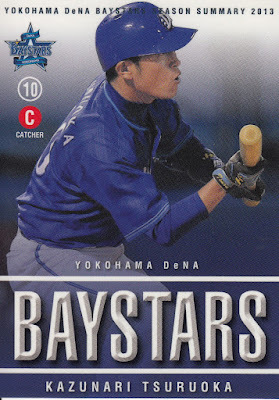 He also had cards in sets from Upper Deck, Konami, Bandai and Front Runner. 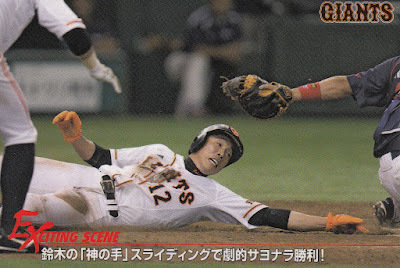 Long time Giants outfielder/pinch runner Takahiro Suzuki retired after this year's Climax Series. 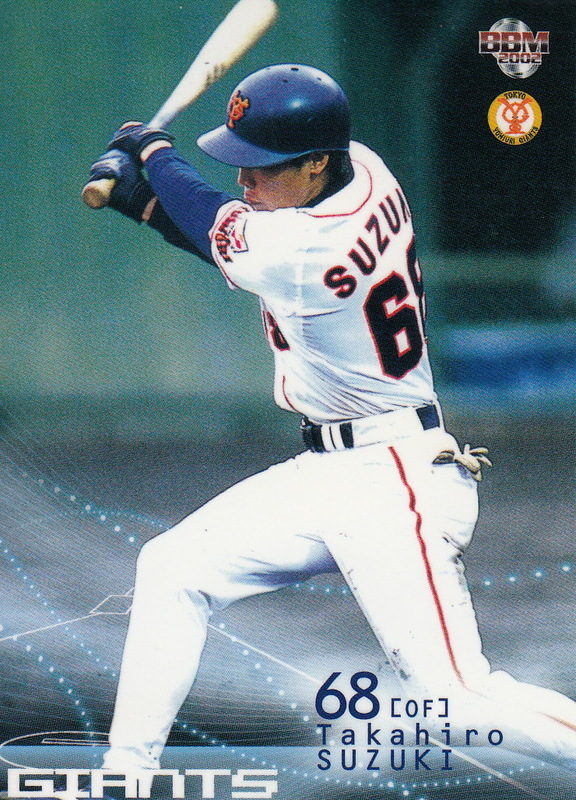 Suzuki was drafted as an infielder out of Soma, Fukushima Prefecture High School in the fourth round of the fall 1996 draft by the Giants. 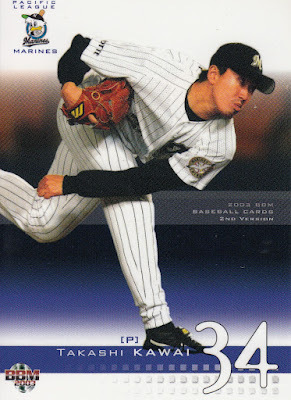 He didn't make his ichi-gun debut until April of 2002. 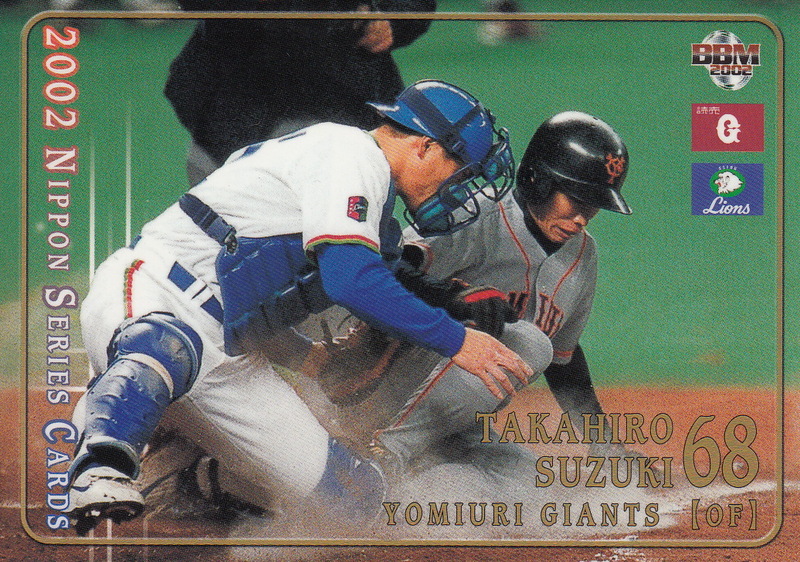 He spent most of his career as a late inning defensive replacement and a pinch runner although injuries to Yoshinobu Takahashi (who'd of thunk it?) 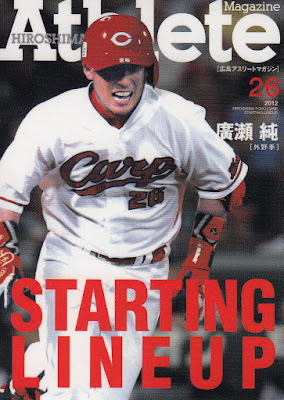 lead to him getting a bit more playing time in 2008 and 2009. 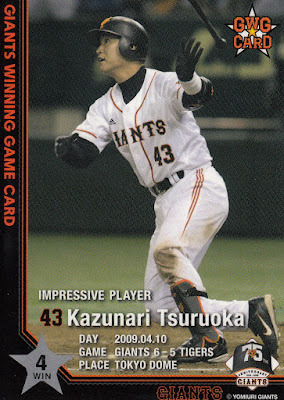 He appeared in five Nippon Series with the Giants (2002, 2008, 2009, 2012 and 2013) and won an "Outstanding Player" award for the 2008 Series. In at least two of those five Series he didn't have any at bats. 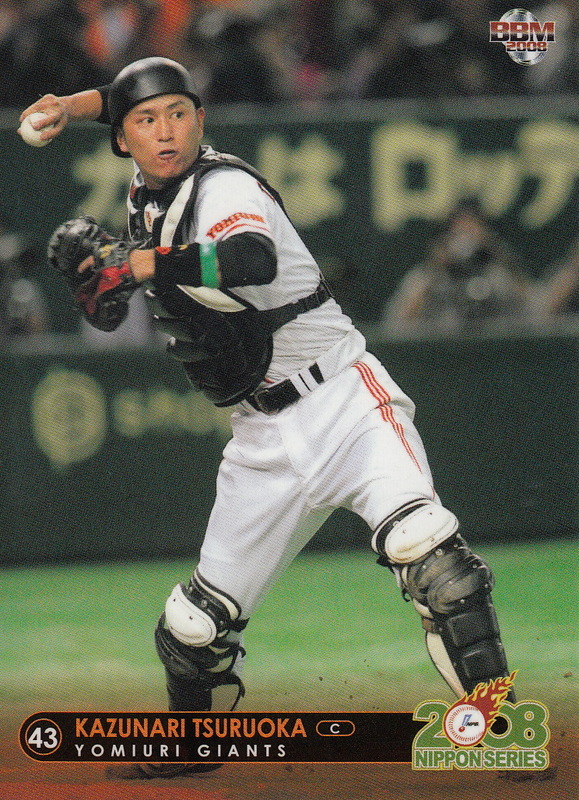 He won a Golden Glove as a part time player in 2008 and somewhat controversially made the All Star team in 2015 (he was named to the team by his manager Tatsunori Hara while Swallows first baseman Kazuhiro Hatakeyama who would eventually lead the CL in RBIs that season was left off the team). 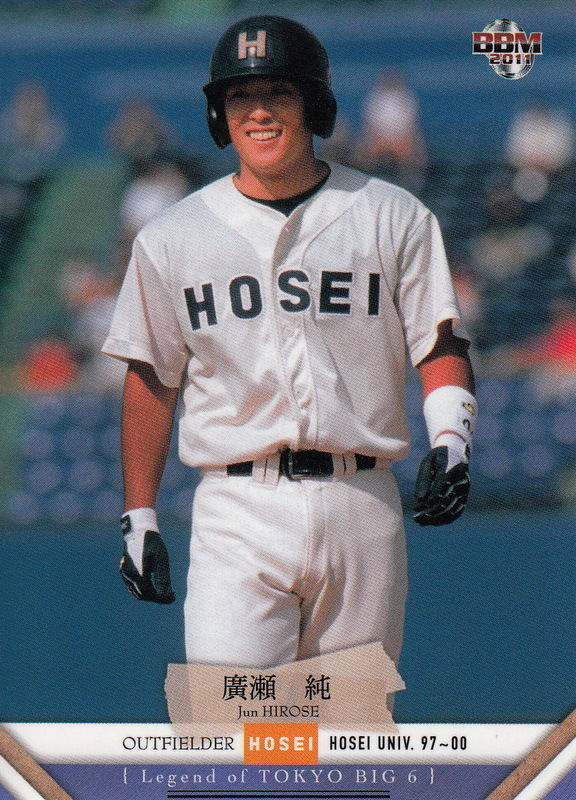 He holds the NPB record for most stolen bases by a pinch runner with 132. 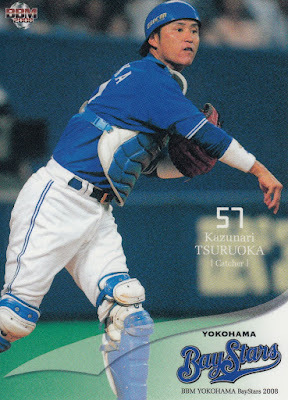 His BBM rookie card (which I don't have) is #485 from the 1997 set. He didn't have another card in a BBM flagship set until the 2002 2nd Version set and actually only had 11 cards in BBM flagship sets over his 20 year career (including the two I've mentioned here). 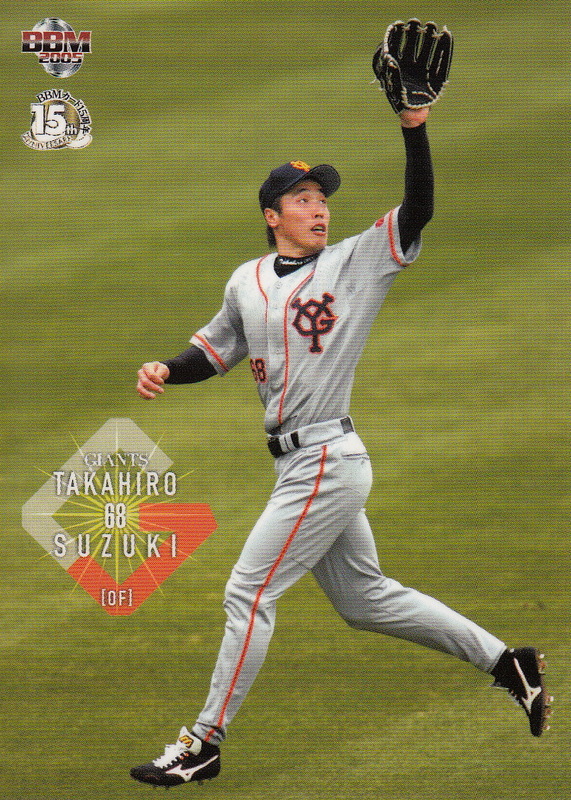 His first Calbee card was #086 from the 2007 set. 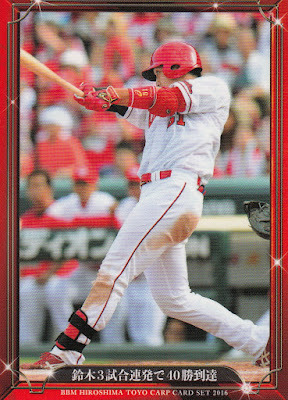 He also appears in some of Konami's and Bandai's sets. 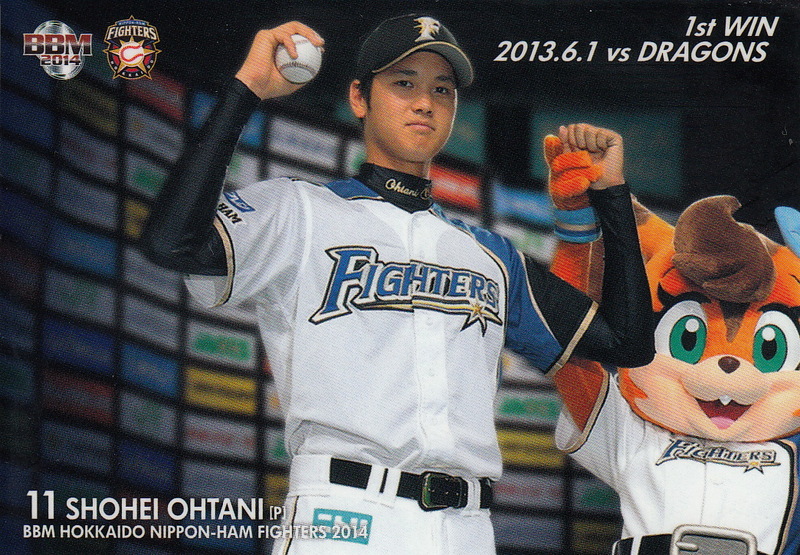 NBP announced the Best 9 teams last Friday. 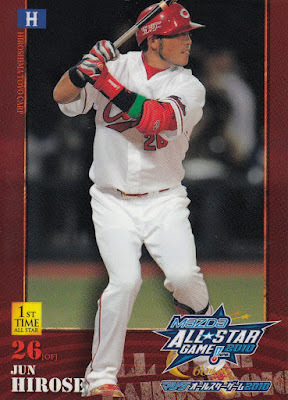 For those who don't know, the Best 9 Awards are basically a post-season All Star team. There's one player at each position in each league (hence the "9" although the Pacific League picks a DH as well). 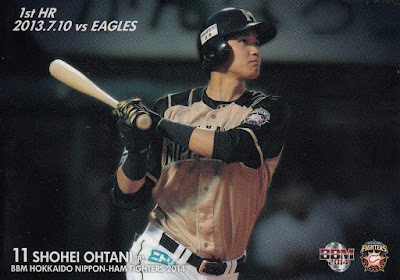 NPB changed the rules for the voting this past season to allow a player to be voted on in more than one position which allowed the result that I think they were aiming for to happen - Shohei Ohtani made the Pacific League Best 9 team as both the pitcher AND the DH. 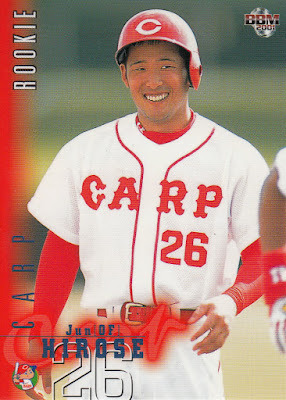 This is of course the first time that a single player has ever been named to the team at two different positions in the same year. BBM's Fighters team set from 2014 contains cards that feature his first three victories (he went 3-0 in 2013) and his first three home runs (he hit four in 2013). 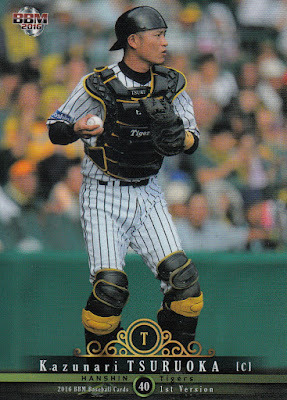 Hanshin Tigers catcher Kazunari Tsuroka has decided to hang up his cleats after a 21 year career in NPB. He was the fifth round draft pick for the Yokohama Baystars in the fall 1995 draft out of Shinko Gakuen High School. 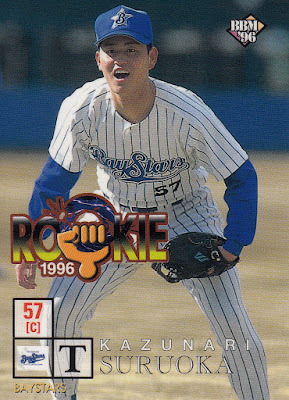 He didn't debut with the ichi-gun team until almost five years after he was drafted. He spent a few years in the 00's as the primary backup catcher for Yokohama behind Motonobu Tanishige, Takeshi Nakamura and Ryoji Aikawa before being traded to the Yomiuri Giants in June of 2008 for Hiroki Sanada where he would again be the primary backup catcher, this time for Shinnosuke Abe. 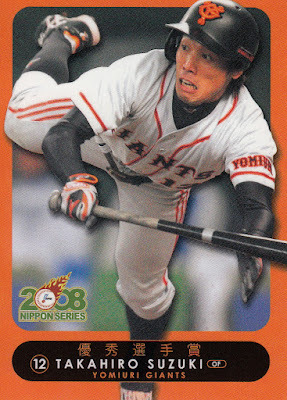 A shoulder injury to Abe pressed Tsuruoka into the starting role for the Nippon Series in 2008 which the Giants lost to the Lions. He left the Giants as a free agent following the 2011 season and returned to Yokohama. He was the starting catcher for the Baystars for the 2012 and 2013 seasons, the only time in his career that he was a team's number one catcher. After two seasons in Yokohama he was on the move again - this time to the Hanshin Tigers as compensation for the Baystars signing Yasutomo Kubo. He pretty much split the starting catcher duties his first two seasons with the Tigers (with Ryutaro Umeno in 2014 and Akihito Fujii in 2015) but spent most of 2016 with the farm team. 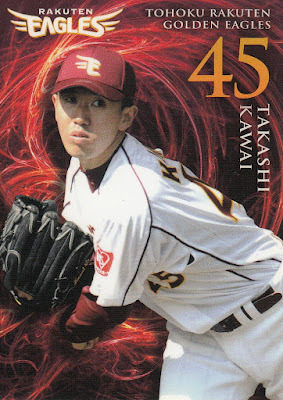 He did appear in his second Nippon Series, starting a couple games in the 2014 Series in a losing effort against the Hawks. 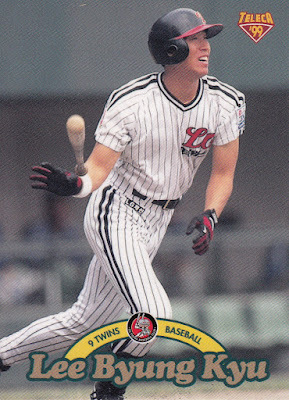 His BBM rookie card is #491 from the 1996 set. 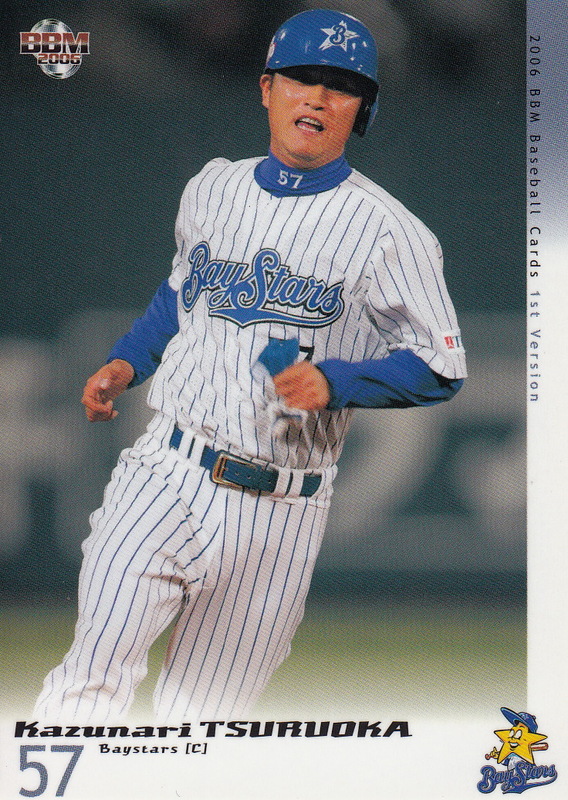 He doesn't appear on another baseball card until BBM's Baystars team set in 2003 and doesn't appear in another BBM flagship set until 2005. 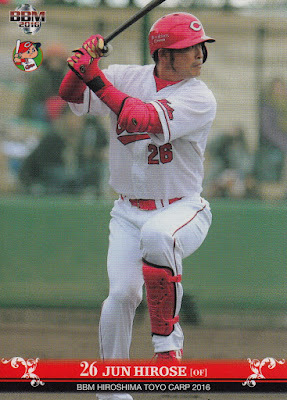 He only ever had one Calbee card (2009's #258) but he did appear in sets from Konami, Bandai and Front Runner. Yet another long time NPB player who retired at the end of the 2016 season is Eagles pitcher Takashi Kawai. Kawai was drafted out of Josai University in the third round of the fall 1998 draft by the Marines (their first two picks in the draft that year were Masahide Kobayashi and Tomoya Satozaki). 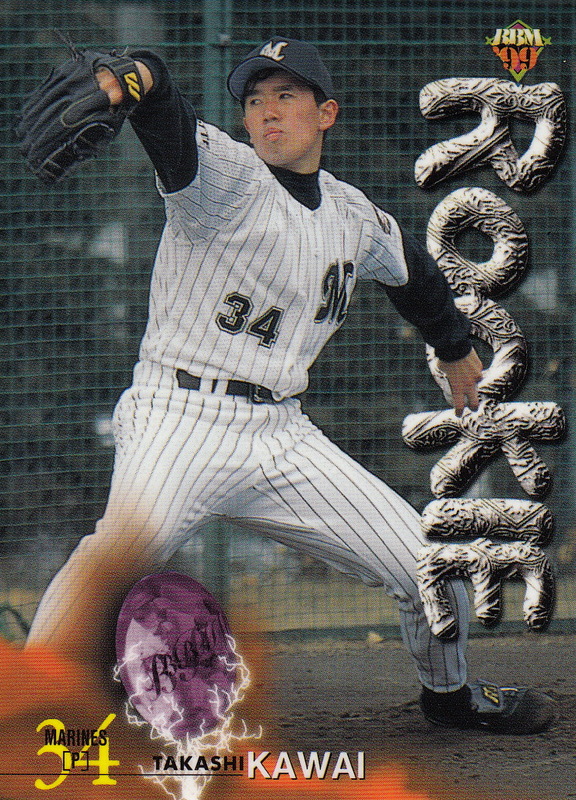 He pitched mostly out of the bullpen for Lotte, putting together a couple decent years in 2001 and 2002 before he started to lose effectiveness. 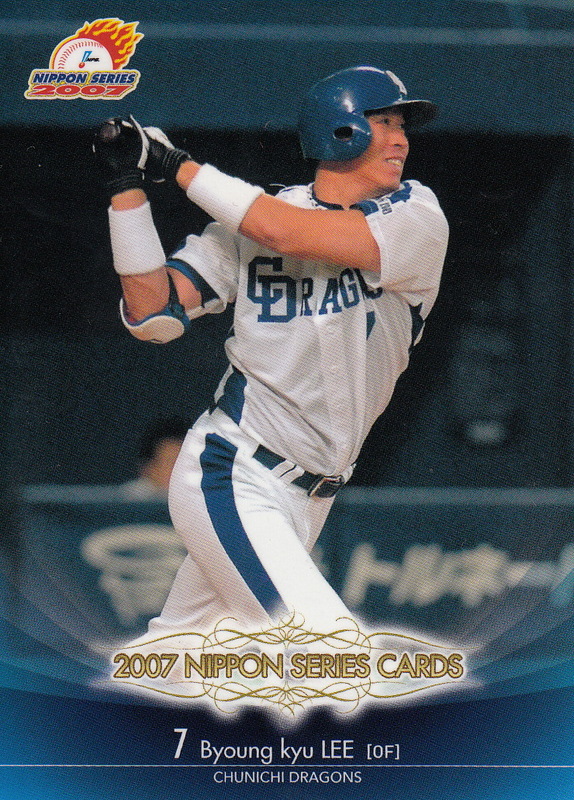 The Marines traded him to Tohoku in May of 2006 for Ken Shinzato. 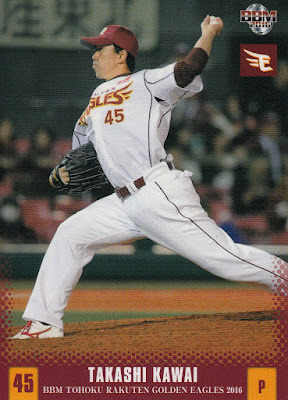 It looks like he spent most of his time with the Eagles with the farm team - he only had maybe 4 out of the 11 seasons he spent in Sendai where he had more than 10 appearances with the ichi-gun Eagles. 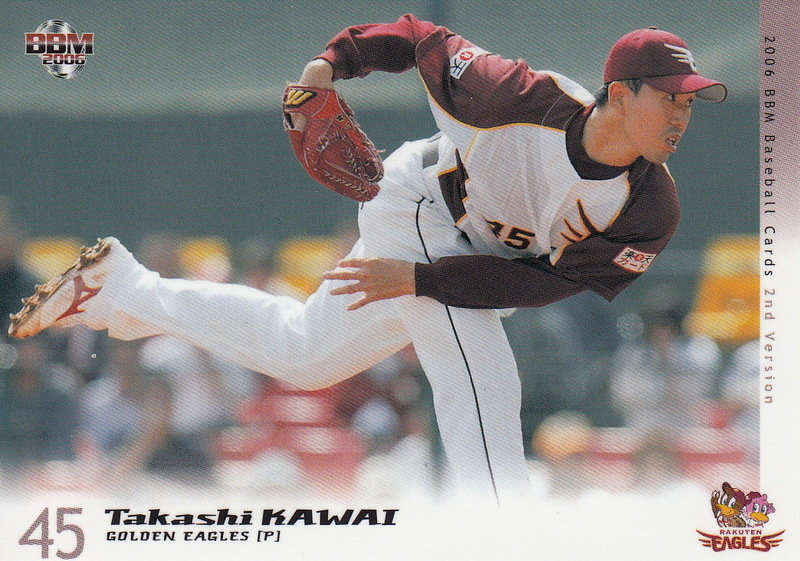 I don't think he made any appearances in the 2013 Nippon Series with the Eagles and he didn't pitch in the 2005 Series with the Marines. His BBM rookie was #514 from the 1999 set. He never had a Calbee card but he did appear in sets from Future Bee, Konami and Bandai. 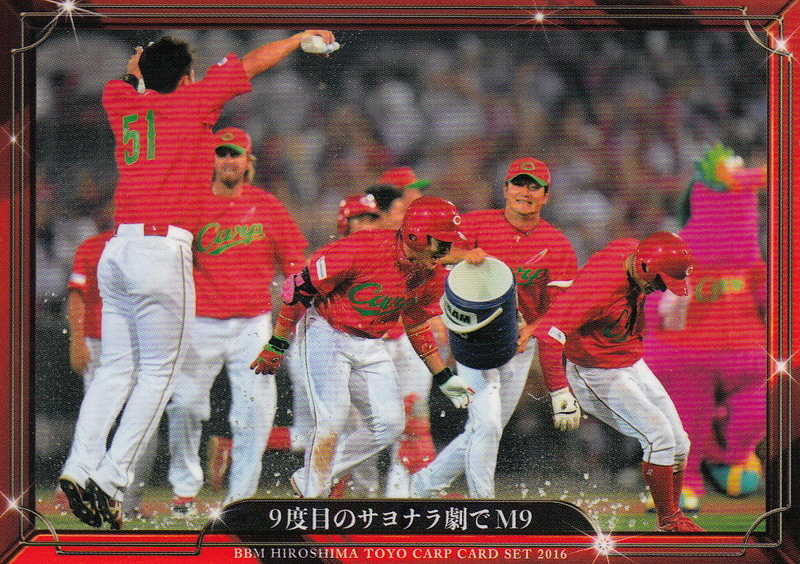 Today I received my copy of BBM's box set commemorating the Hiroshima Toyo Carp's 2016 Central League pennant, their first since 1991. 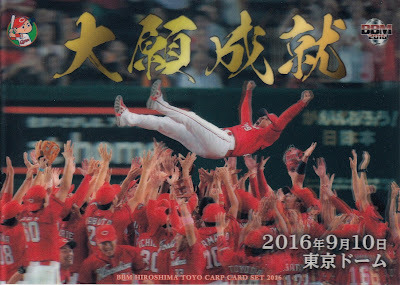 The set is entitled something like "Realization Of A Great Ambition" which probably sounds less clumsy in the original Japanese. The box contains 55 cards - a 54 card base set plus one of four possible large 3-D cards. 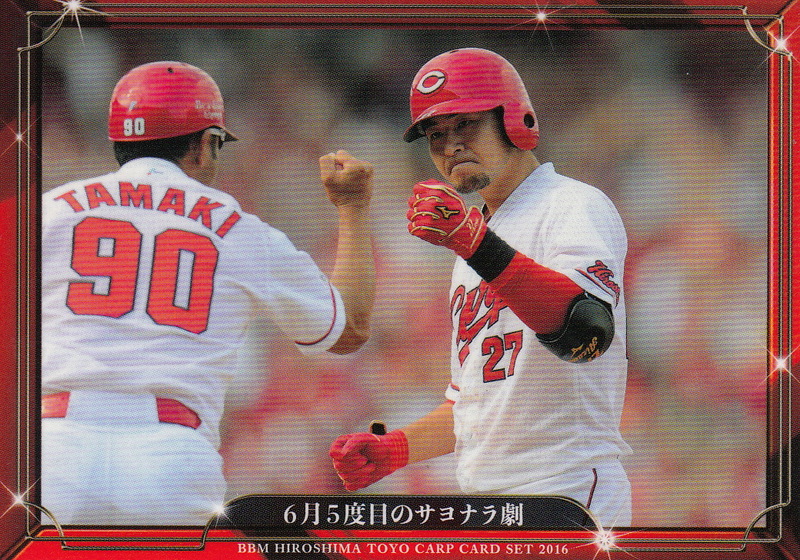 I really like this set. 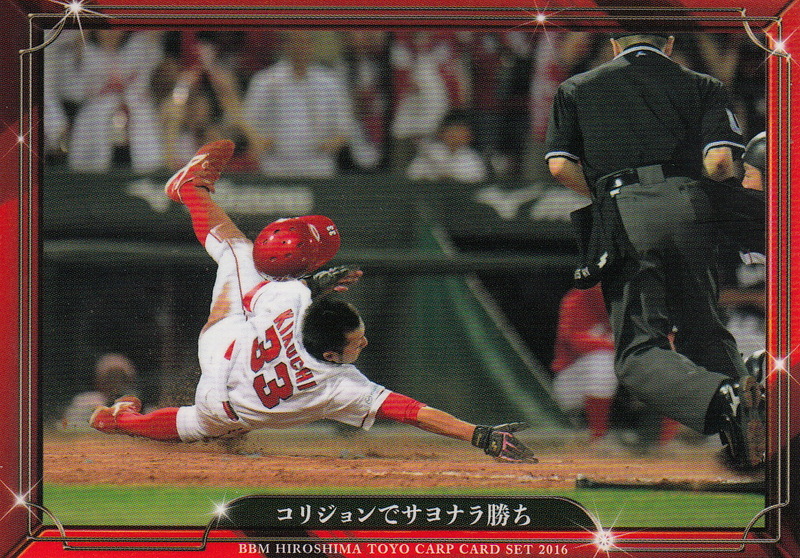 The photo selection is outstanding and the card layout is very nice (despite the borders on the cards). 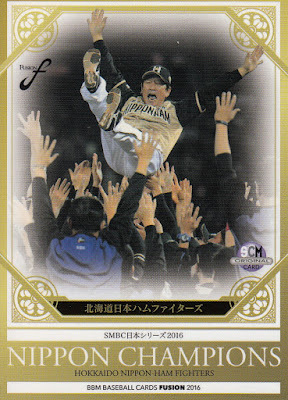 I'd love to see BBM continue to do sets like this for pennant winners in the future. 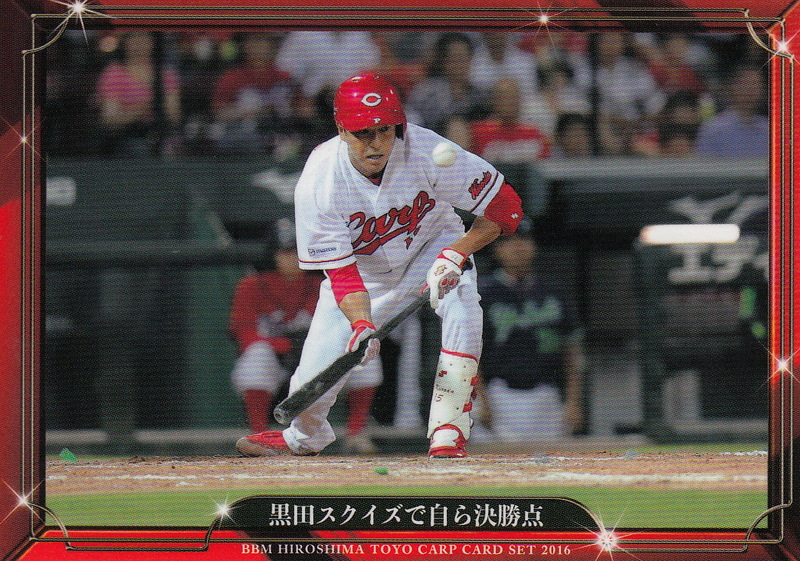 It looks a bit better in person than in a scan. You can see all the cards for the set (and one of the other 3-D cards) over at Jambalaya. 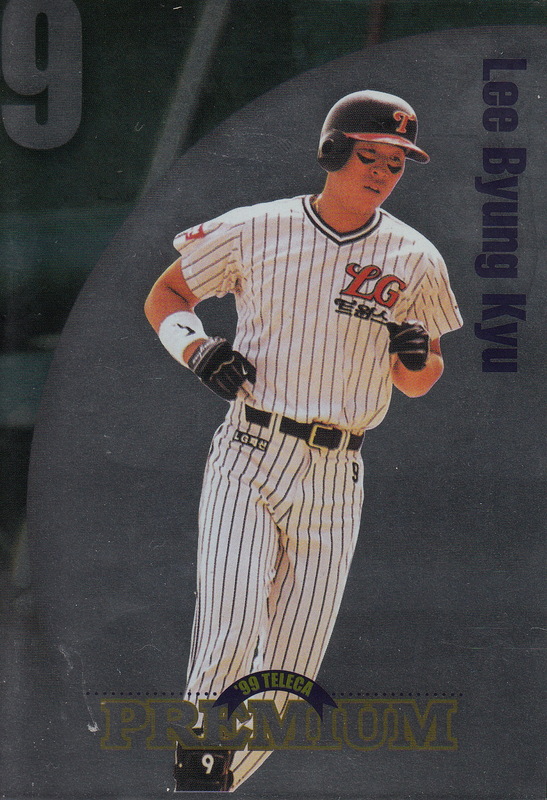 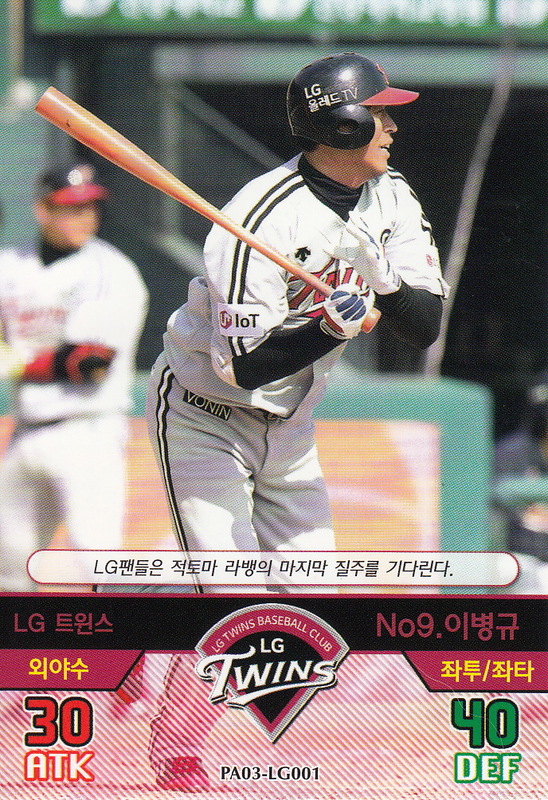 Long time LG Twin and one time Chunichi Dragon Byung-Kyu Lee announced his retirement this week. Lee was the first round pick of LG in the 1997 KBO draft out of Dankook University. 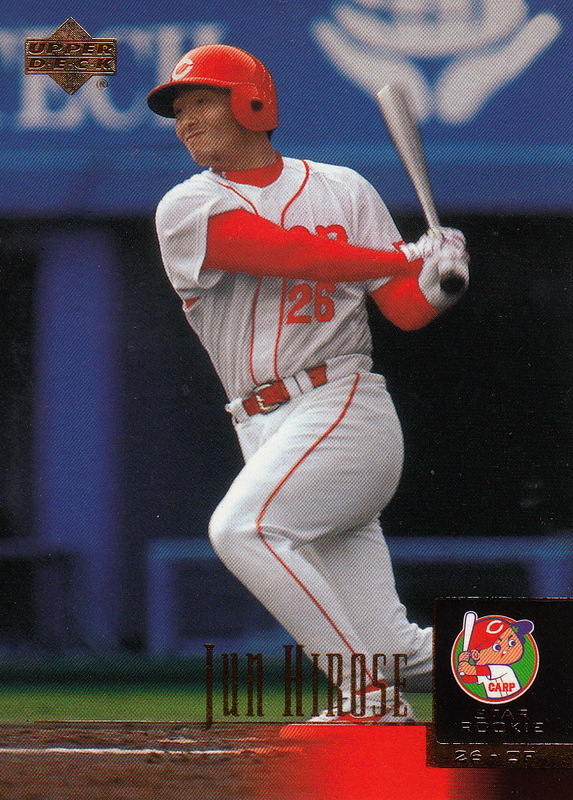 He was a star from the beginning, hitting .305 in 1997 and winning the Rookie Of The Year award. Over the next 9 seasons he would hit over .300 five times including a league leading .337 in 2005. 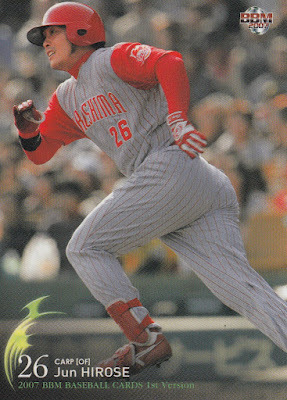 His best season was 1999 when he hit .349 with 31 home runs, 31 steals and 99 RBIs (none of which lead the league). He lead the league in hits each year from 1999 to 2001 and also in 2005 and lead the league in runs scored in 2001. 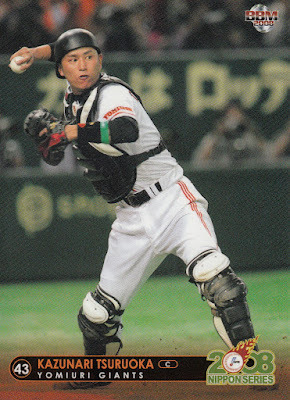 He won a Golden Glove award six times between 1997 and 2005. 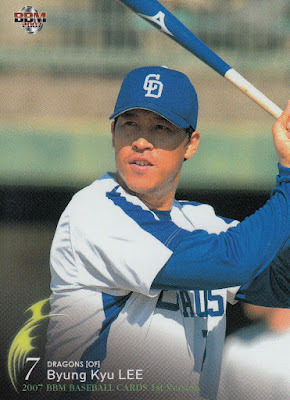 After the 2006 season, Lee decided to try his luck in Japan and he signed with the Chunichi Dragons. 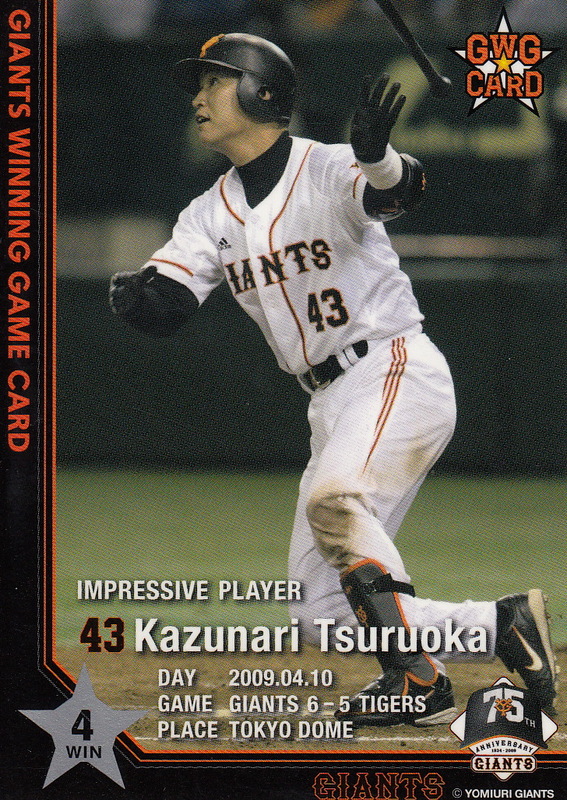 He ended up spending three seasons with them (2007-09) with diminishing results each year (.262 in 132 games in 2007, .254 in 105 games in 2008 and .218 in 28 games in 2009). 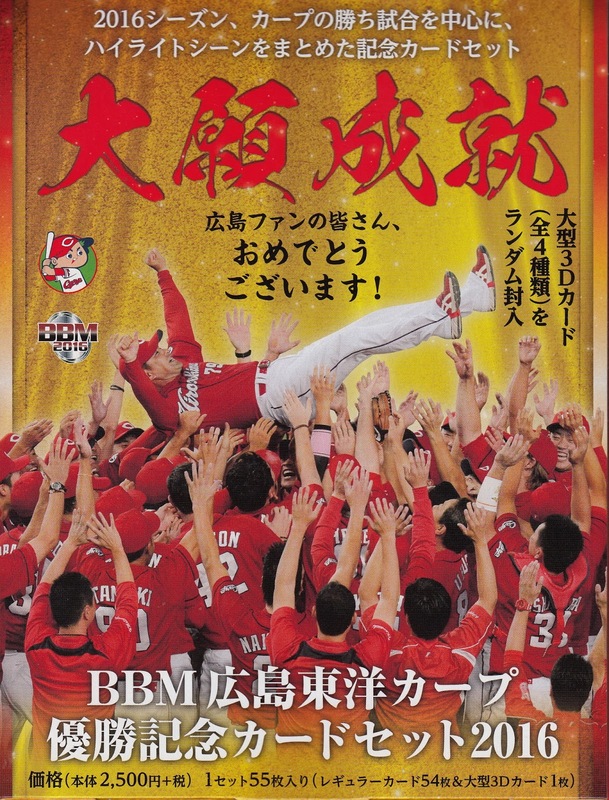 The highlight of his three years in Nagoya was the 2007 Nippon Series where he helped the Dragons to their first title since 1954 when he hit a two run home run in Game 2. 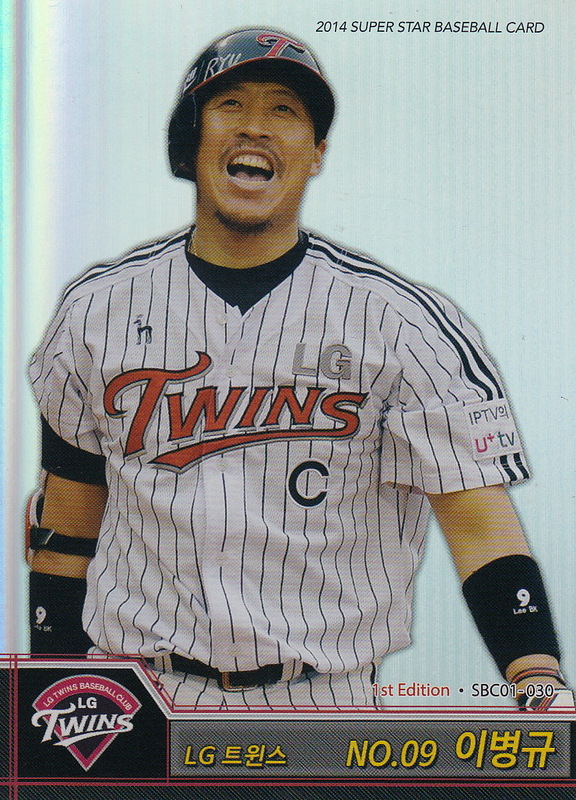 Lee left the Dragons and returned to Korea, the KBO and the LG Twins in time for the 2010 season. 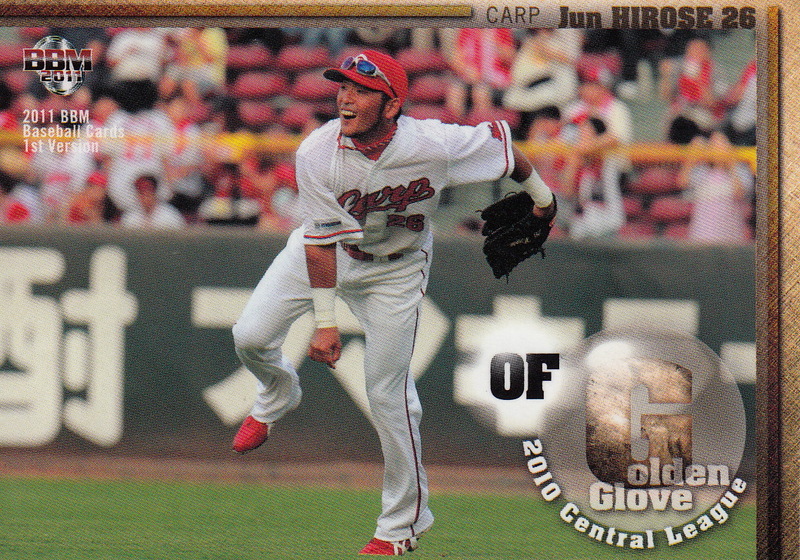 He hit over .300 three more times including a second batting crown in 2013 (with an average of .348). He won another Golden Glove in 2013 and was MVP of the KBO All Star game in 2011. 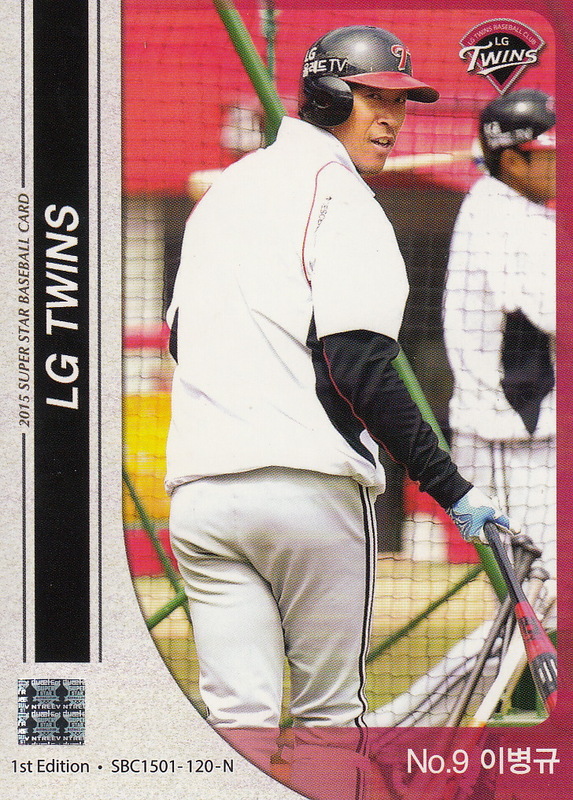 Age and injuries (I think) started to take their toll after 2013 and after only making one appearance with the Twins this season he has decided to hang it up. 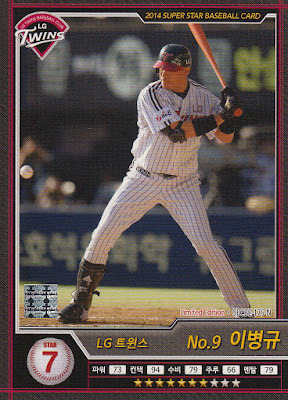 He is one of what I think are only four hitters with more than 2000 hits in the KBO - he has a total of 2043 in the KBO plus 253 in NPB.